Looking for a great Instagram quote maker? Fortunately, there are tons of resources available—and this post rounds up the best of the best. Quotes are short, snappy phrases that often offer a little boost of inspiration or encourage introspection. From the Roman Empire to the Industrial Revolution to the social media age, quotes have long been a part of how we, as humans, communicate with each other. 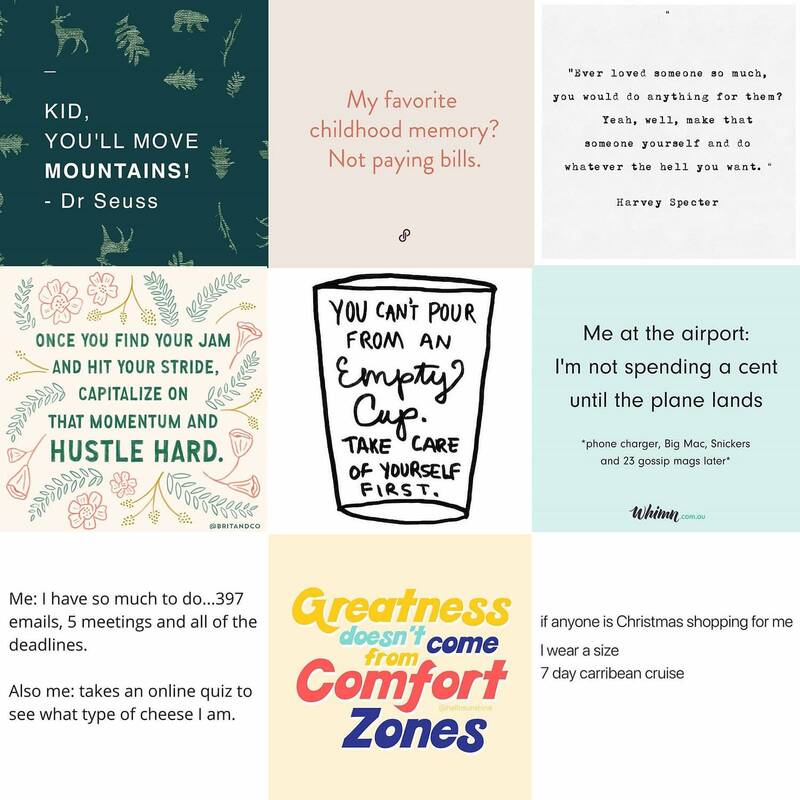 Scrolling through your Instagram account and hashtags, you likely see dozens of funny, inspiring, or quirky quotes like the ones below. But, quotes are more than meaningless quips. They might just be the perfect addition to your Instagram strategy. Here is why—and how to create fantastic quotes your followers will love. Quotes tend to get a great deal of engagement on Instagram (which is a great signal for the Instagram algorithm), garnering hundreds or even thousands of likes and comments. It turns out, there is science behind our love affair with pithy quotes. Quotes serve as a small dose of self-coaching, pushing us to work harder and believe in ourselves. They affect us on a primal level, driving us to take the words of our role models to heart. We love quotes because as humans, we want to believe the world or our lives can be better. Quotes give us the inspiration we need to push forward when times are tough. Before we get into how to use Instagram quote maker apps to create awesome quote posts, let’s discuss how to integrate quotes into your Instagram marketing strategy. This will ensure your quote posts excite your audience instead of inspiring eye rolls. Quote posts should not be filler content you use to simply fill up your queue when you can’t think of anything better to post. (If you’re stuck for images, check out How to Take Good Instagram Photos on Your Phone: The Ultimate Guide). Quotes should be well-thought out, well-designed, and implemented with a strategy in mind. Consider the pain points your audience has and use quotes to show you understand how they feel. The quotes don’t need to be related to your brand (though it might be), but they do need to be connected to a shared experience. For example, if you have a brand targeting mothers, you might choose a quote about the pain of reheating coffee three times a day. If your focus is freelance digital designers, you might choose a quote commiserating about flakey clients. Also, be sure to double-check the source of your quotes. A quick Google search can save you from misattributing a well-known quote. Or, share a story related to the post or share how the quote affected your life. The purpose is to start conversations, generate engagement, and create connections with your followers, not just gather meaningless likes. 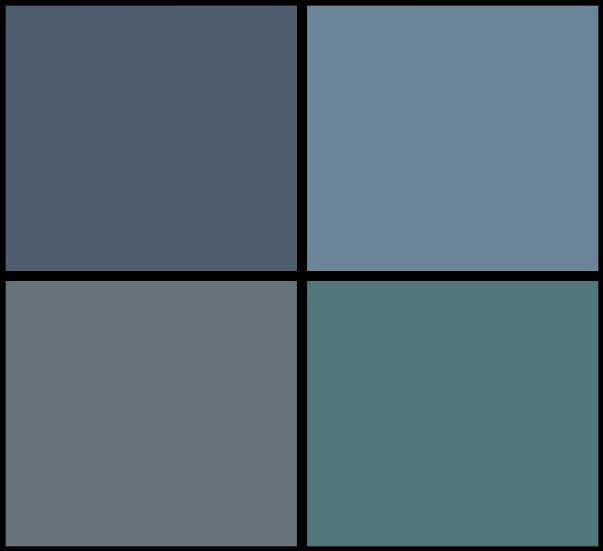 When creating your quote posts, be sure to use colors, fonts, or images that your customers will recognize as you. You might also consider adding a watermark or logo to your quote image. If any of your audience shares your post, you will get additional exposure! No one said quotes have to be from famous people! You can also use quote posts to share what your customers love about your brand. Just be sure to ask for permission and tag the original poster on Instagram, if you can. People on the internet will say just about anything. Watch what happens when Casper employees respond to your tweets. If you want your quote posts to stand out, you can’t use the same tired old quotes and fonts every other brand is using. Here are a few places to source fresh quotes with an emotional impact. 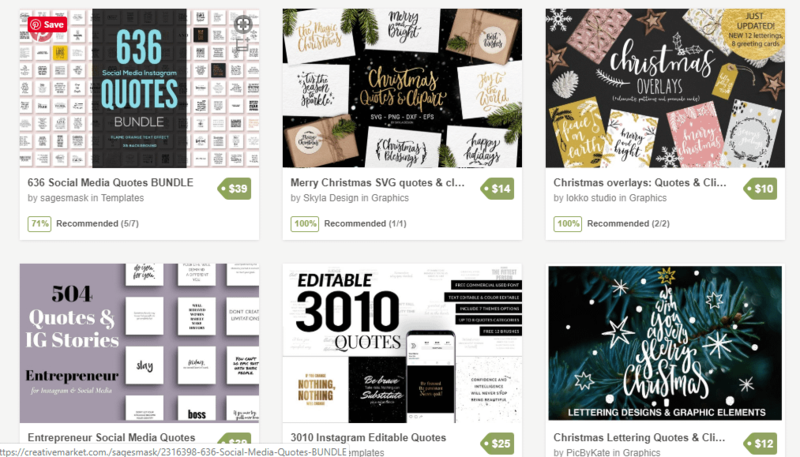 Creative Market, an online marketplace for finding digital design assets, offers several packages of Instagram quote templates. Many include the quotes and allow you to resize, add elements, and include your own background so your post is your own. This social media platform popular with readers and writers is also an excellent resource for quotes on just about any topic you can imagine. You can search by keyword or author. 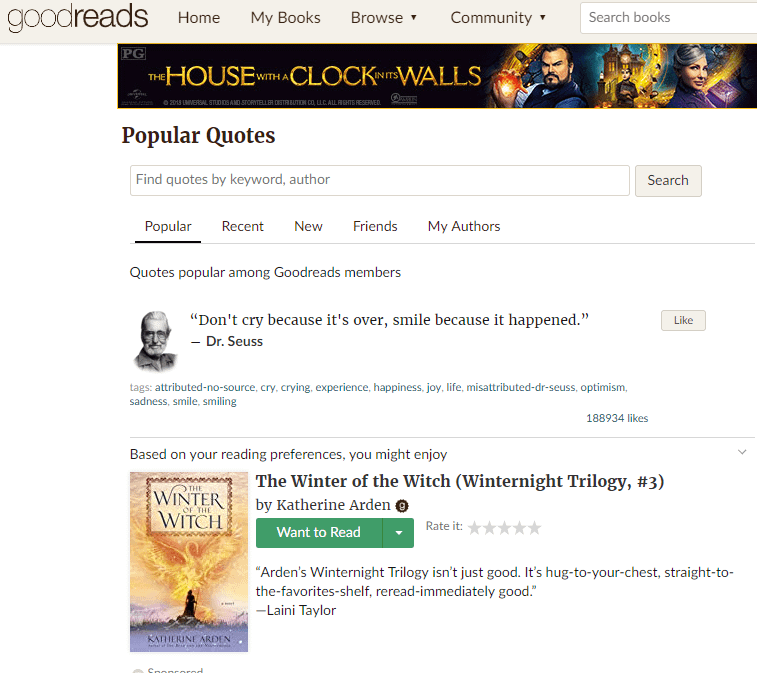 Goodreads will also tell you what book the quote is from, so you save time trying to source your quotes. The second page of Google might as well not exist to most of us, but it is a great place to find fresh quotes that aren’t being shared by every other Instagram account in your niche. Type in “quote topic + quote,” then scroll to the bottom and check out page two. You might find a few resources you didn’t even know existed! 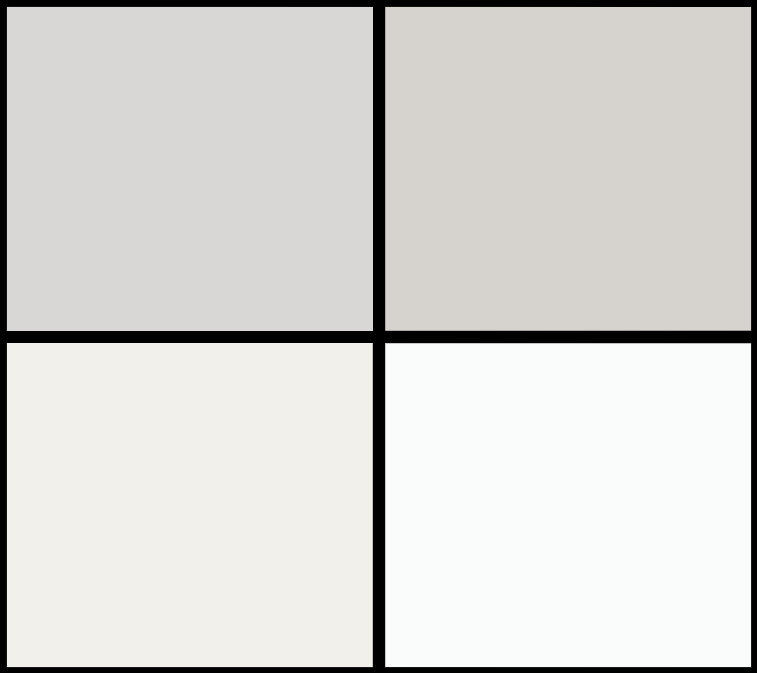 Also check out the Google Image results for images of posts. Brainy Quote houses thousands of quotes on hundreds of different topics. 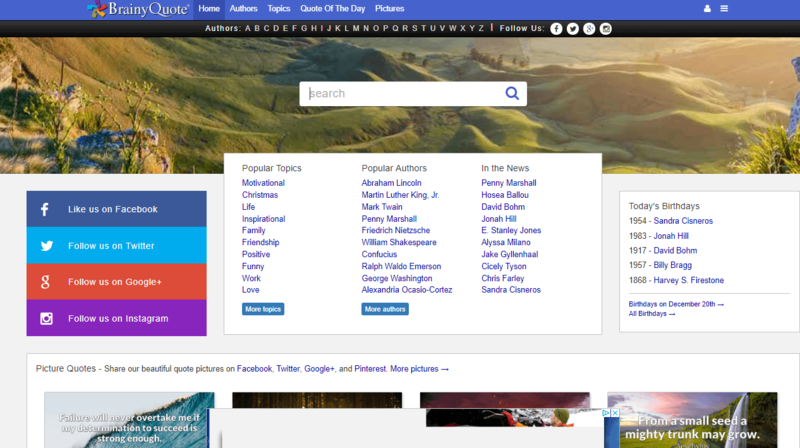 You can search by author, topic, or just browse their homepage to find a quote that fits your mood. Most quotes include the author. Some of the apps you can use to create your quote posts actually have built-in libraries of quotes to choose from. We’ll take a look at a few of the top apps below and note which ones have quote libraries. Now that you know where to find your quotes and have figured out how to include quotes in your Instagram strategy, it is time to start getting creative. 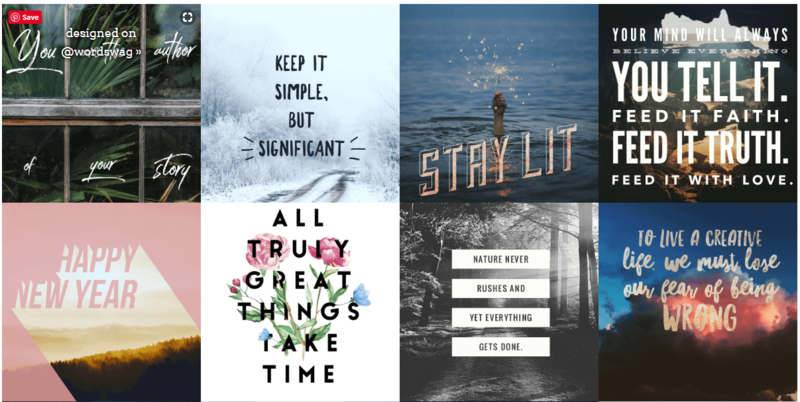 Here are our favorite Instagram quote maker apps and why we love them. Available for both iOS and Android, Quotes Creator is an Instagram quote maker app full of features to make some awesome Instagram posts. Features I love include the ability to add logos or watermarks, a huge library of background photos, over 400 fonts, and an integrated quote library. If you want to upload your own image to use as the background, you can do that, too. Quotes Creator also supports 19 languages, including English, Arabic, Danish, Dutch, Chinese, Turkish, Russian, and Korean. Price: Free to use with ads, or you can upgrade to the Pro account for $3.99. This is a bit more than just an Instagram quote maker, it is a full-fledged design app for creating images for Instagram, Facebook, blogs, and more. 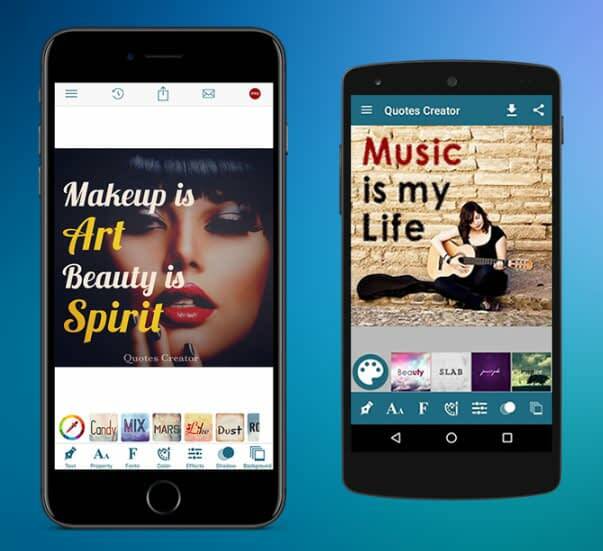 You can choose from the web version of Canva or the app version, which is available for iPhone, iPad, and Android. 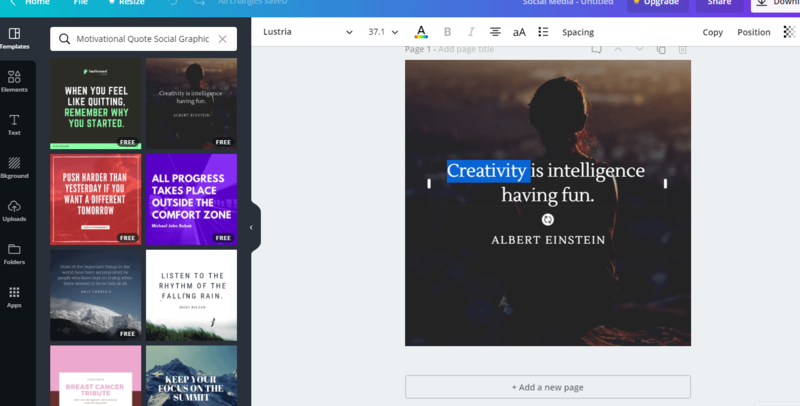 Canva offers a lot more customization options than dedicated Instagram quote makers, which might be overwhelming if you only need to create quote images. However, if you are already using Canva or are looking for a tool that does a bit more, Canva is a fantastic option. My favorite features include a large template library, which makes it super simple to create an Instagram quote post. Start by searching for a template. 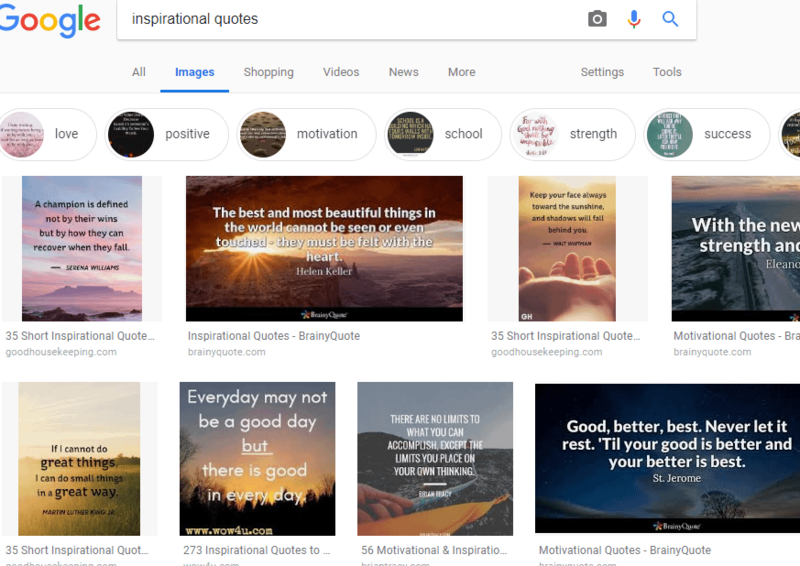 Below, I searched for “motivational quotes” and was able to choose from about a dozen free templates. The templates are easy to edit and allow you to change the background, add new features, change fonts, move the text, and much more. Canva saves your posts, so you can also create your own template for reuse next time. 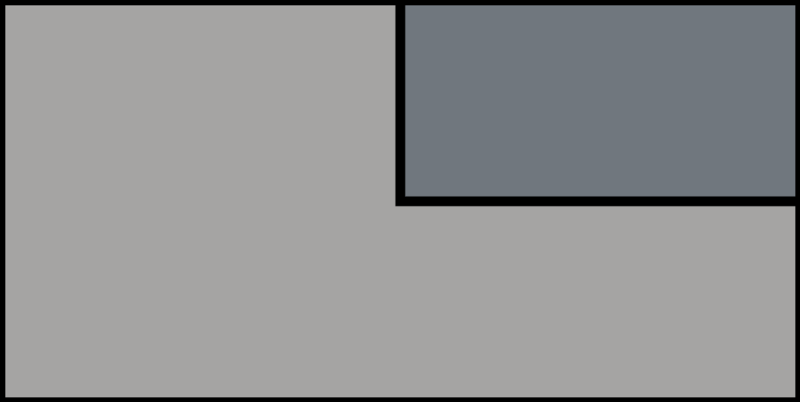 (This is useful if you want to use a specific font and include a logo, for example.) 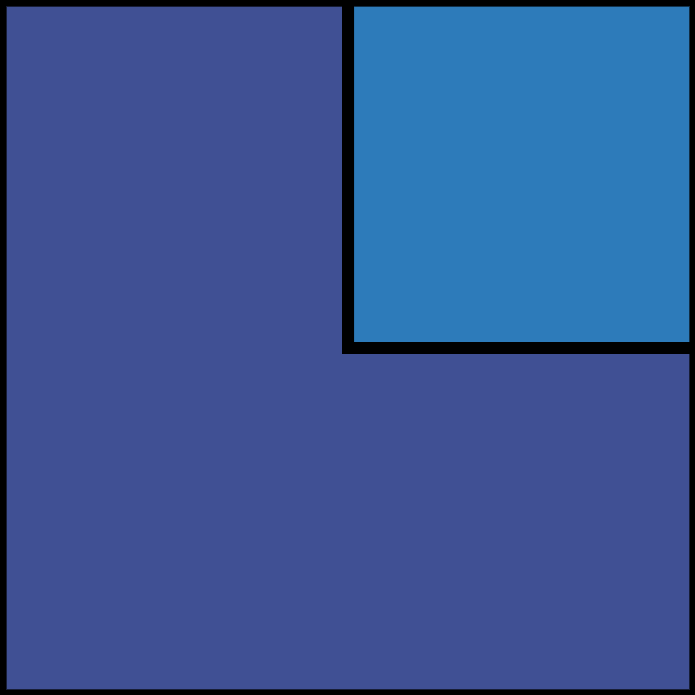 You can resize your image to use on Facebook or another platform. Price: Canva is free to use, though some backgrounds, images, and fonts come with a small fee, usually around $1. You can easily use the free version if you don’t want to pay, there are still plenty of free options. Price: Free, with in-app purchases. You can purchase additional background packages for between $.99 and $3.99. 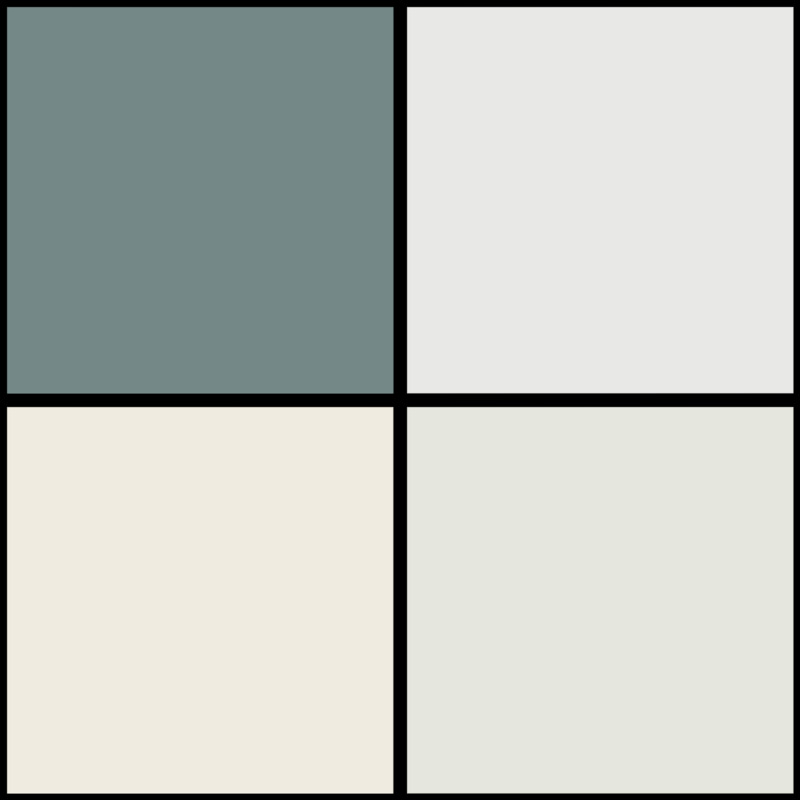 This is one of the easiest Instagram quote maker apps to use. Word Swag is available for both iOS and Android, so you can use it no matter what type of device you have. The one downside to Word Swag is you don’t have as much control over how your design looks. Other apps allow you to adjust the font size, spacing and even curve your font. Word Swag touts itself as a “designer in your pocket.” Unfortunately, that means limited customization options. However, the designs look great, so if you are looking to create quotes fast and are less concerned with the ability to customize, Word Swag is a great option. Price: Free, with the option to pay for a premium subscription for additional features, including more fonts, the ability to add your own logo, custom colors, gold foil font, multiple text layers, and more. Premium subscription costs $3.99 per month. The ability to design and order physical products, such as phone cases and shirts. This Instagram app maker falls somewhere between quote-focused apps like Quotes Creator and full-fledged design tools like Canva. Text2Pic allows you to add text to photos but also lets you create logos and posts for other social media accounts. Text2Pic is a great option if you are looking for an in-between tool to create quotes and do a bit more. It is easy to use, has a robust free version, and doesn’t overload you with features to figure out. Price: Free, with in-app purchases for additional fonts, backgrounds, etc. Quotes are super popular on Instagram, which can make it hard to stand out. But with the right strategy, you can share quotes that are on-brand, engaging, and generate a ton of likes. Instead of creating just another quote image, take the time to consider what your audience might react to. Think about what pain points and shared experiences might push their button, and think about how you can use quotes to start conversations. Then, choose one of the apps above to start creating unique quote posts your followers will love.